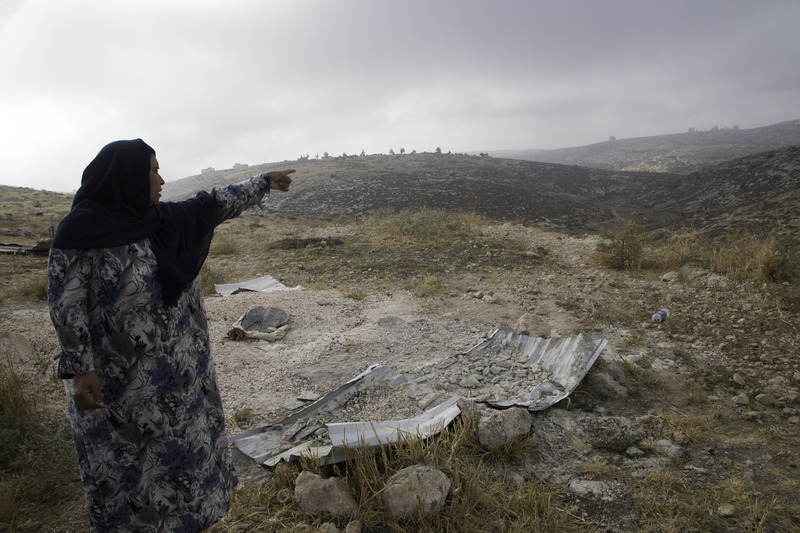 Three weeks ago, resourceful little Walaa was quick-witted enough to use her cell phone to film settlers flying a drone and when the settlers suspected her, to pretend convincingly to be on a call with her aunt. A week later, she leaned against Aziza’s legs, drooping and coughing. Aziza, clearly concerned, kept feeling Walaa’s forehead and eventually sent her home. That first weekend of Ramadan was exceptionally hot, over 30 degrees in the shade. The children were limp. 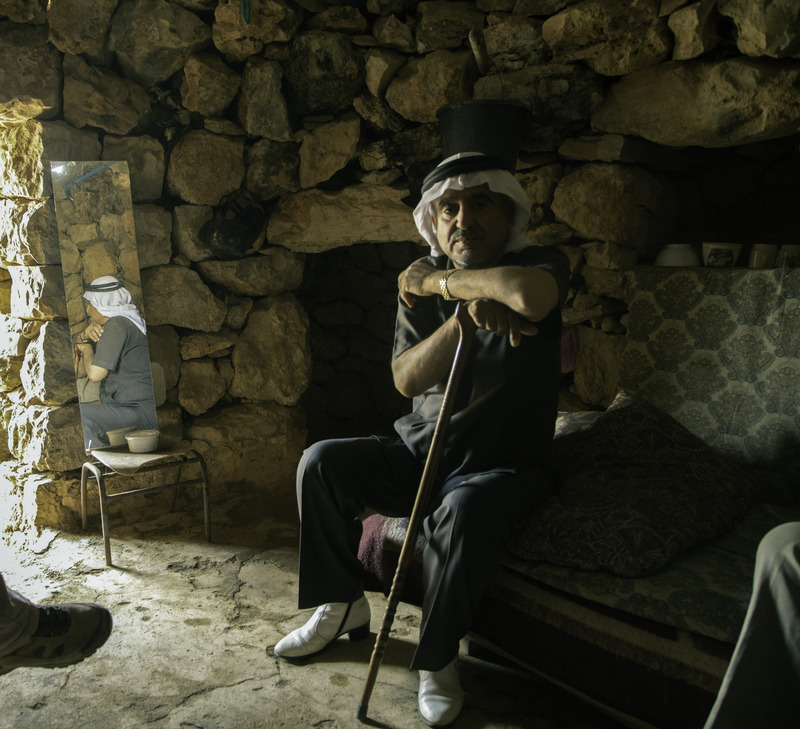 Members of the activist group Ta’ayush travel from Jerusalem to South Hebron every week on Shabbat, answering requests from Palestinian shepherds and farmers to accompany them and their flocks to their lands which are close to Israeli settlements. On Ramadan it is not always obvious why we make the trip. 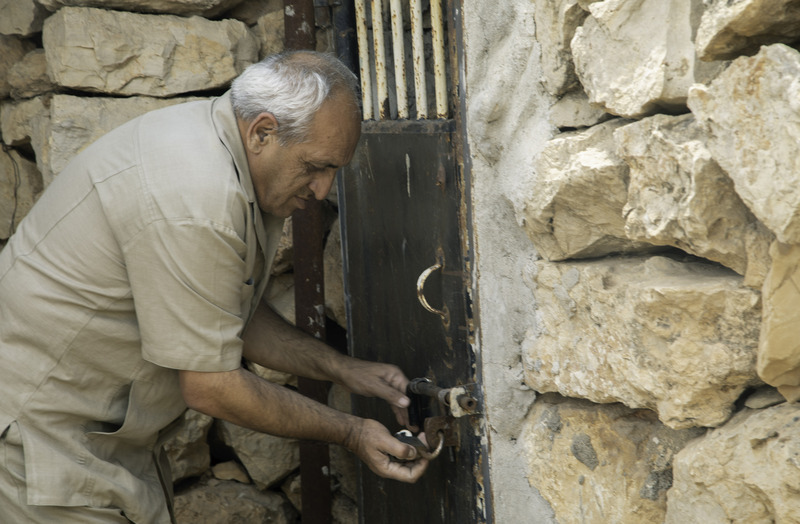 In fact, there are fewer volunteers than at other times, and we don’t see many Palestinians either. 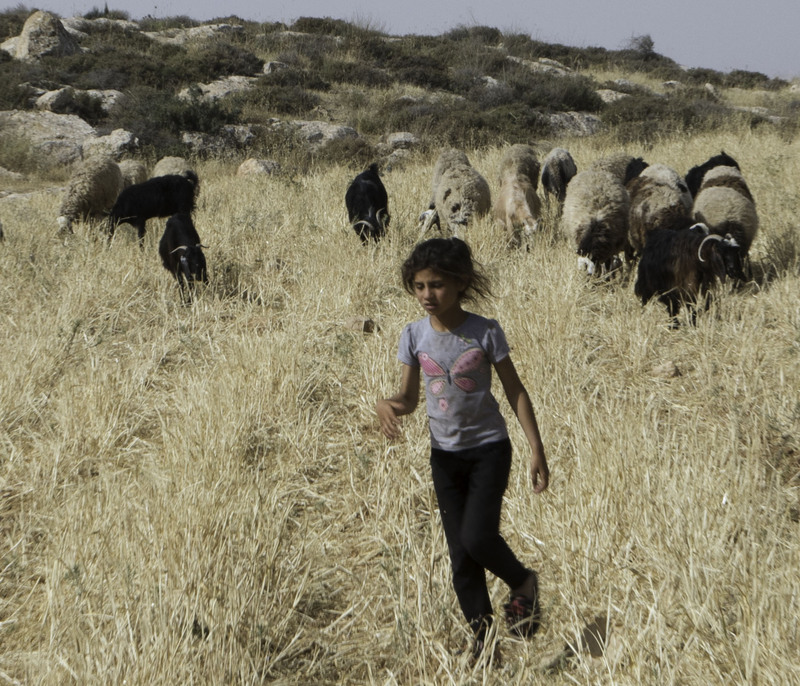 Here, in Umm al-Amad, without so much as water to sustain them on a hot day, shepherds rarely venture down from the hills near home with their flocks into the more intense heat of the valleys close to the settlements. 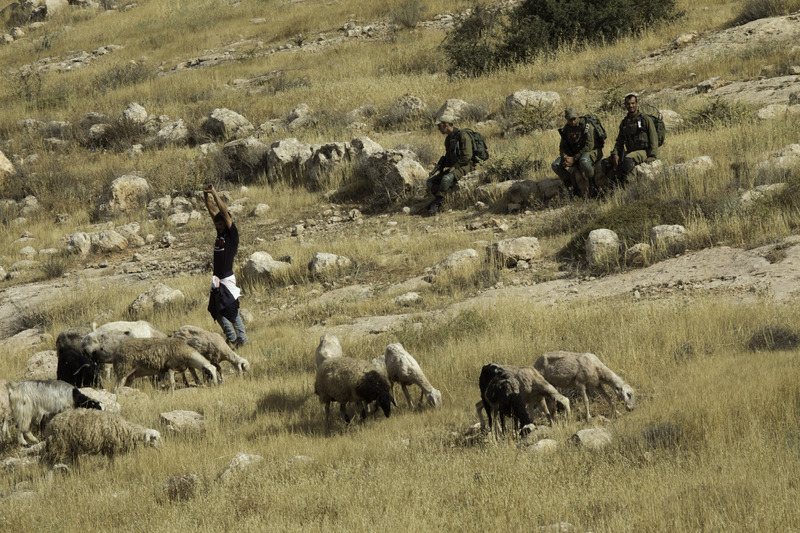 After sending Walaa home, Aziza remained safely uphill with the sheep. Come earlier next time she says and we do. 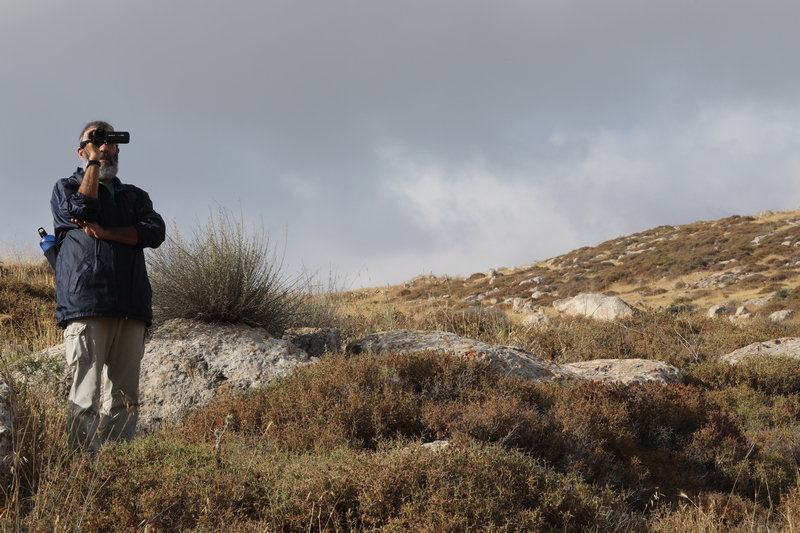 Today, beginning with Umm al-Amad, I try to comprehend why we are here. 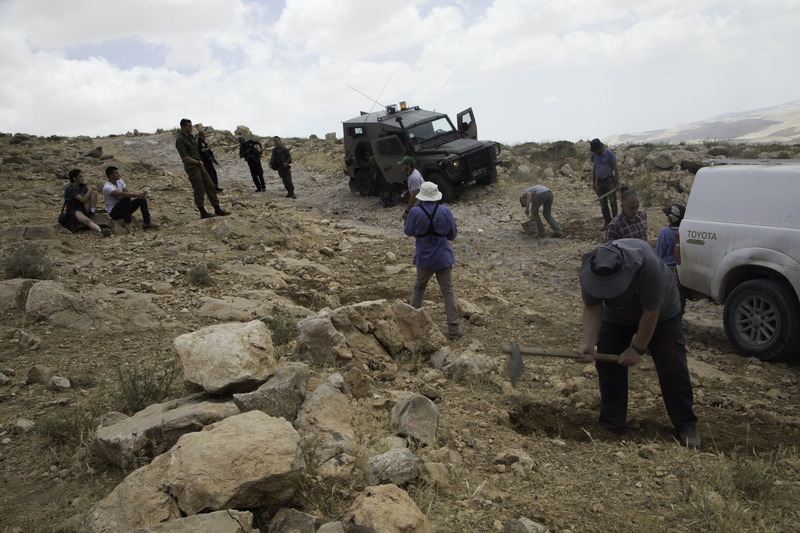 As it turns out, soldiers and settlers make the task easier. We arrive by seven, and it is cooler than last week. From under her canopy, we hear Aziza explain that she will stay home today anyway with both children. 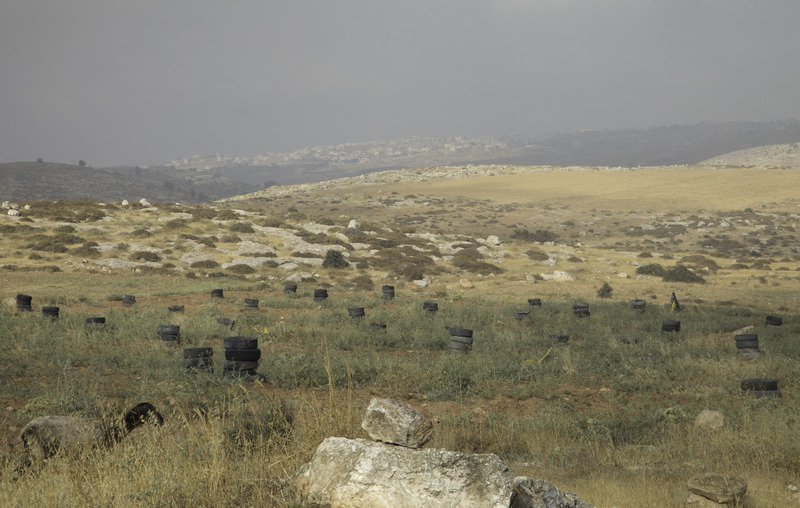 We follow Seff and the sheep through the morning fog past orchards where walls of tires protect the new trees from the goats. From there we descend into the wadi. When the fog lifts, we are joined by soldiers. 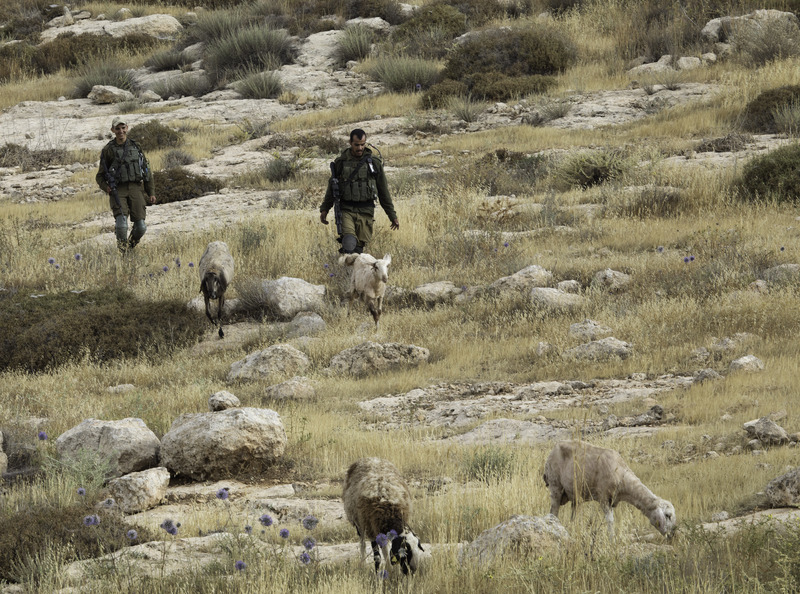 One of us overhears their report: “There are four anarchists here.” The soldiers’ task is to keep the shepherd and the flock away from the settlement by drawing an imaginary line and preventing them from crossing it. 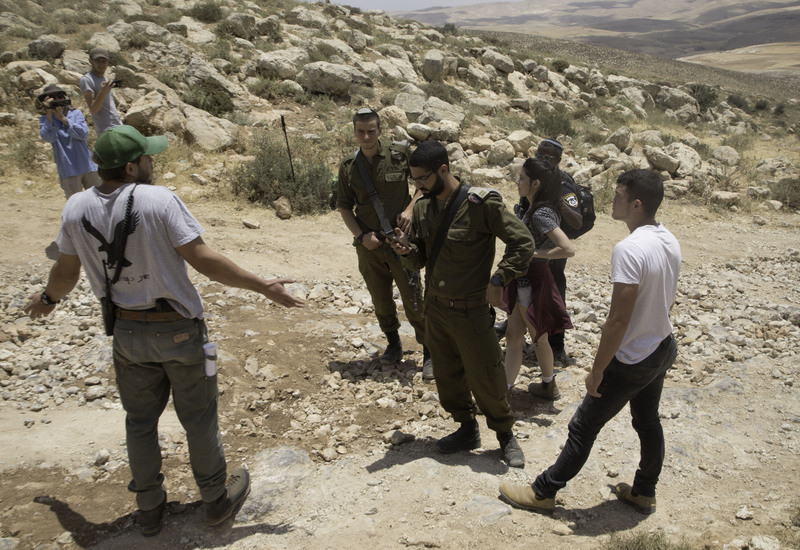 These are city boys from Tel Aviv, loaded down with weaponry, but determined to enjoy a day in the country. It’s a poor substitute for the sound of the shepherd, who controls his flock through virtuoso cries and high-pitched whines as well as strategically aimed stones. Eventually we all settle down to the game of watching: Seff watches the sheep; the soldiers watch Seff and the anarchists; and the anarchists (Guy, Pepe, Caron and me) watch everyone, including each other. 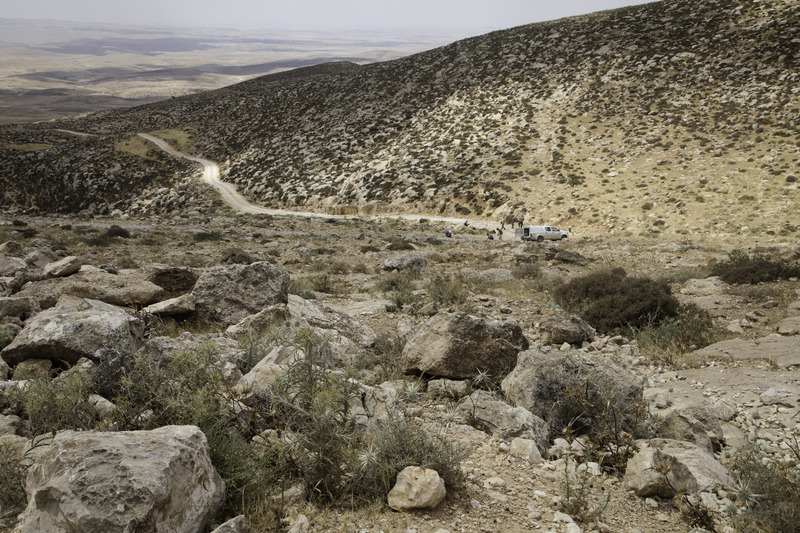 Once Seff crosses another imaginary line, safely beyond the boundary of the settlement, the soldiers drive away. Is it an empty exercise? The shepherds say no. They ask us to come because when they arrive without “anarchists” they have reason to be afraid. With little we can do to help, we use Ramadan to do tasks on our own. 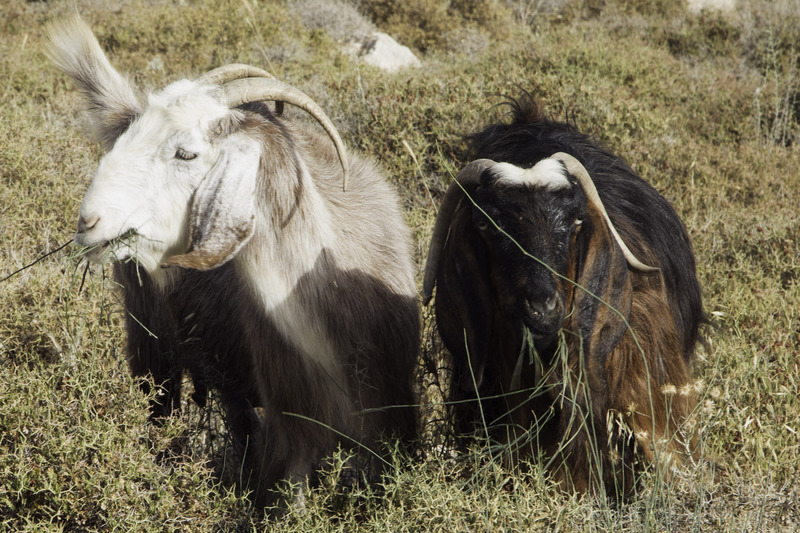 One of them is to labor on the impassable road from Bi’r al-‘Id. Someday it will lead, as it once must have, to Jinba. 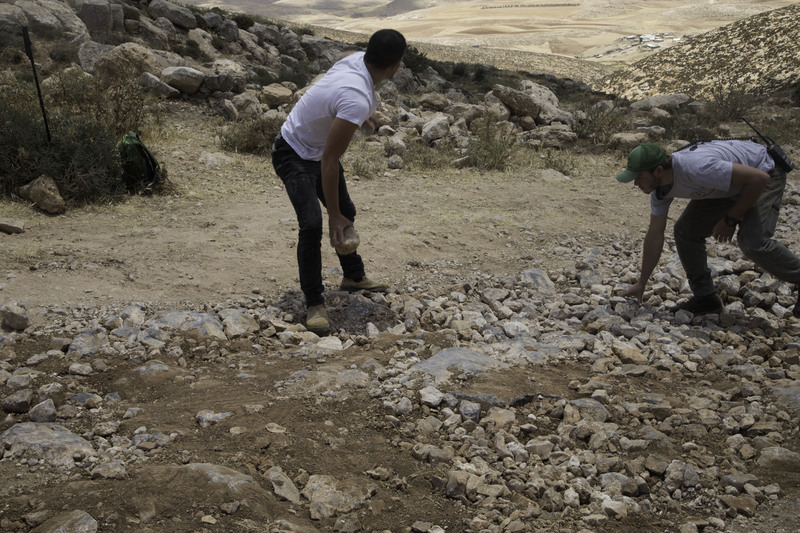 Our hands encased in hot plastic work gloves, we collect rocks from the slopes and bring them to the road in buckets. Then as though assembling a jigsaw puzzle, we artfully arrange the rocks in the gaps: little rocks go here, bigger rocks go there, and the biggest rocks go in the deepest holes. If only we could import heavy equipment and truckloads of materials the work would have ended long ago. At this rate only the youngest among us might live to see it finished. We have written about this absurd process before: here and here. 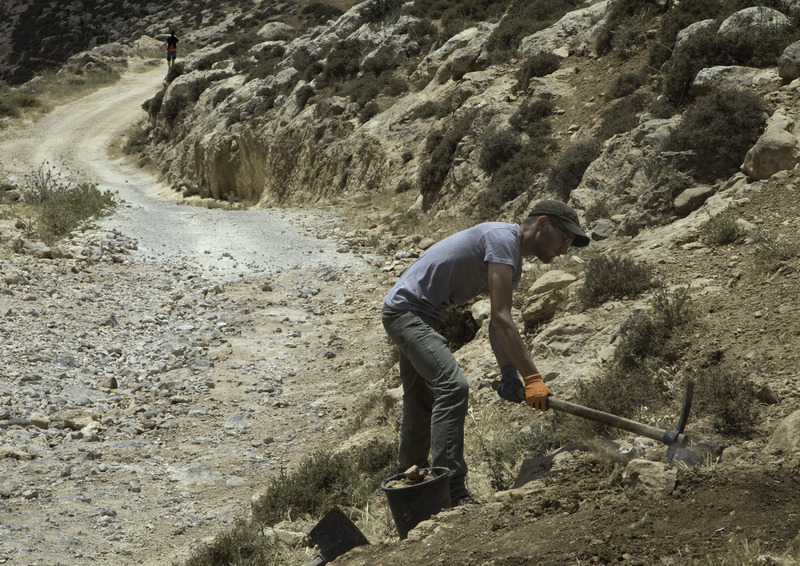 But at least on a hot day like today we will not stay long and I have never known settlers to disturb this work. Until today. 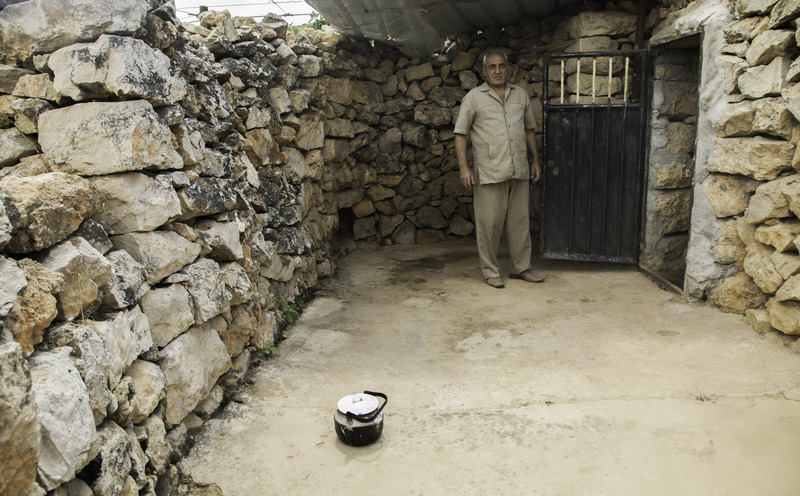 “How about ten more buckets of rocks?” Amiel says, “and then we’ll leave.” At this moment, the two grown sons of the deceased owner of nearby Nof Nesher (population 4) arrive with a friend. They bring with them police, with whom they have lodged numerous complaints about us, and soldiers. 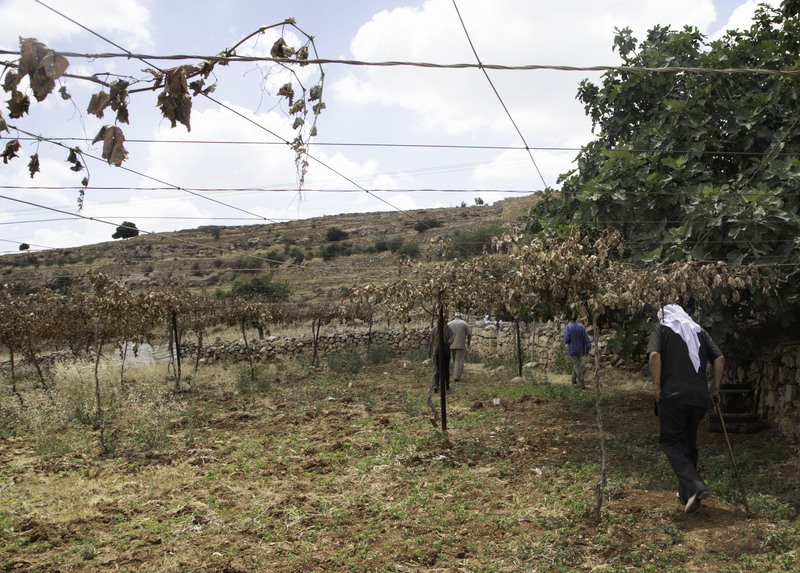 We are picking wild Zatar, a protected plant; the land on which we are working is theirs; a nine-year-old Palestinian girl has tried to stab them. 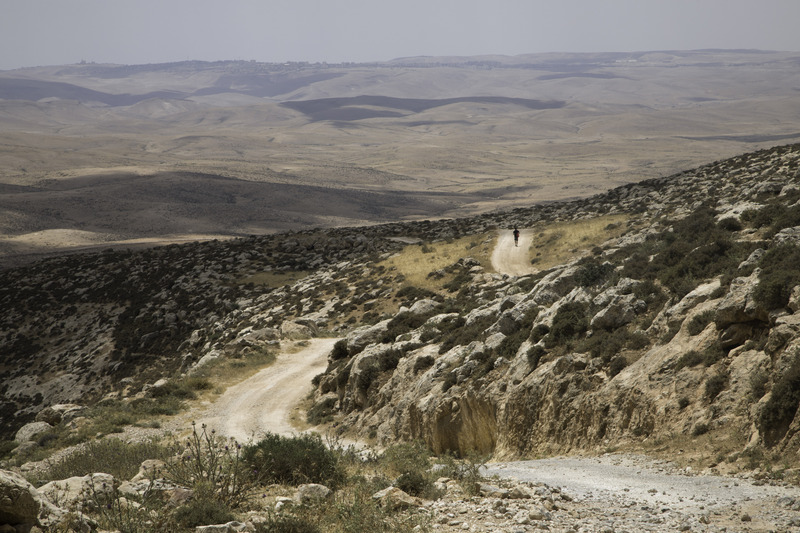 As it happens, zatar does not grow along this road (The zatar ban is a story in itself: you can read about it here); their settlement is illegal even according to Israeli law, and no map places the road on their farm; the story about the child is nonsense. Documents in hand, the police check our IDs or passports, draw some of us, and some of the settlers aside, and begin nearly endless discussions. All this time volunteers are hurriedly continuing the work. Bucket after bucket of rocks pour out onto the road and punctuate the conversations of the bored girlfriend, the shouting of the loudmouth brother in the green hat and the sullen responses of the one in the white tee shirt. 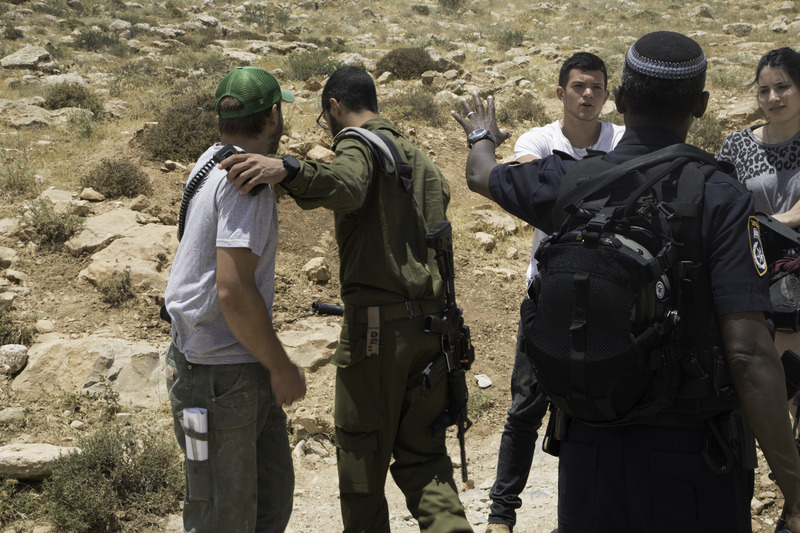 Most of the conversation is out of earshot but occasionally a shouted phrase comes through like “Eretz Yisrael!”; “All this is ours!” Did I hear one of them yell “Misrahi!” at the soldier with the Arabic accent? The soldiers and the police are not fond of these two who constantly bring complaints, but they are not fond of us either. Their lives would be easier if we would only stay in Jerusalem minding our own business. Now the brothers carry out a clever plan. 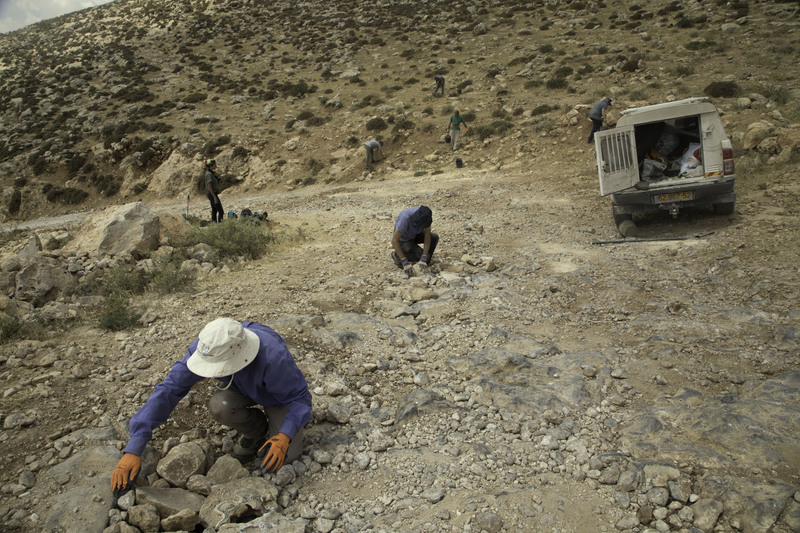 They start to pick up stones we have fitted into the road and toss them back onto the slopes. As one glances in my direction I recognize a grimace I used to see frequently in my middle school days. When they tire of throwing stones they start to build piles of them like little toy roadblocks. 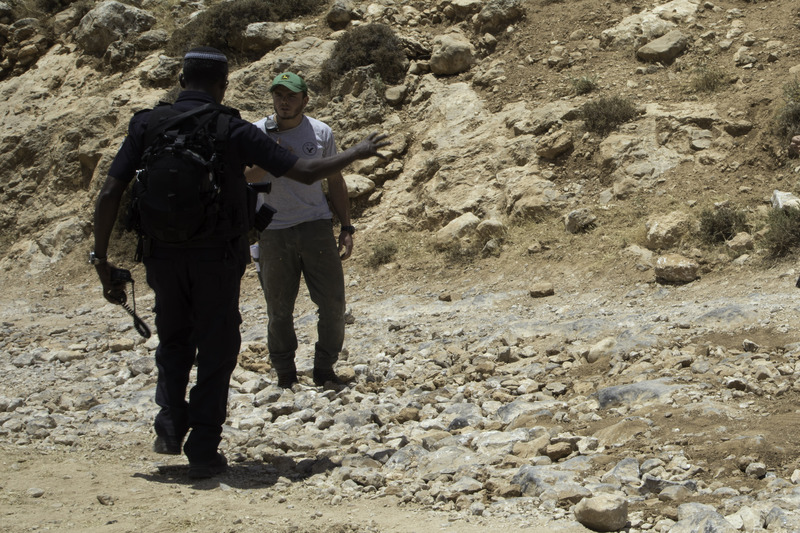 “I have at least as much right to move rocks around the road as they have.” Finally, one policeman loses his patience. A soldier declares the zone closed and everyone leaves. First the brothers leave, and then we pick up our tools and leave, too. We leave hurriedly, because suddenly we are under pressure: we have five minutes to gather our people, gather our things and leave. Aggravated, I complain as we walk back toward the beginning of the road. But Amiel, who sees possibilities in nearly every situation, reminds me that thanks to the brothers, we worked longer and accomplished more than we would have otherwise. They were, after all, the only reason we stayed. 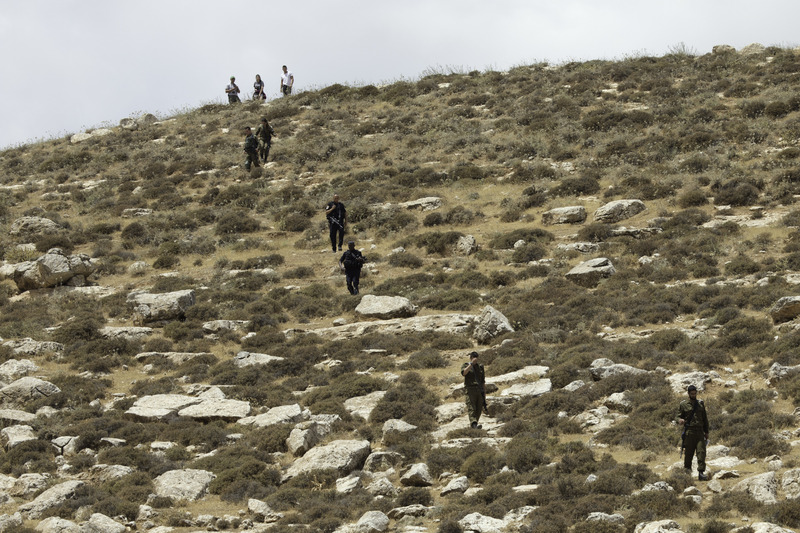 Did I notice any soldier who may be motivated to rethink the occupation by what happened this afternoon? 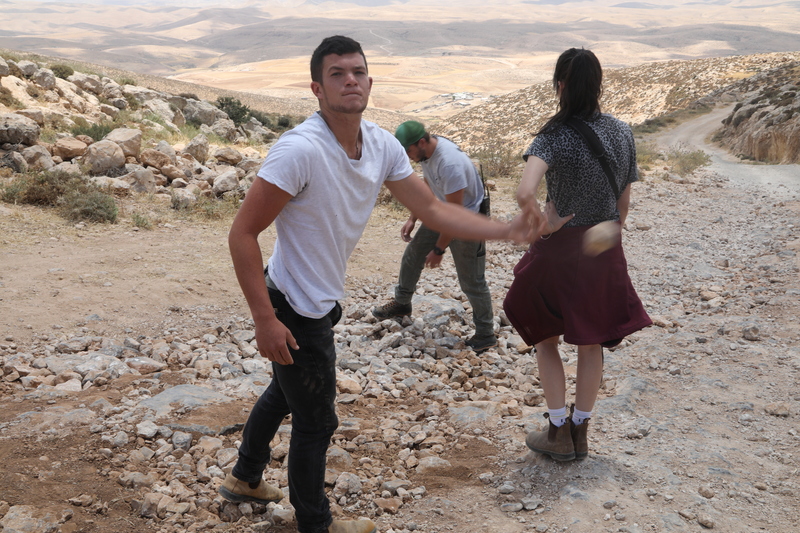 But what about the rocks that the settlers threw off the road? 3. 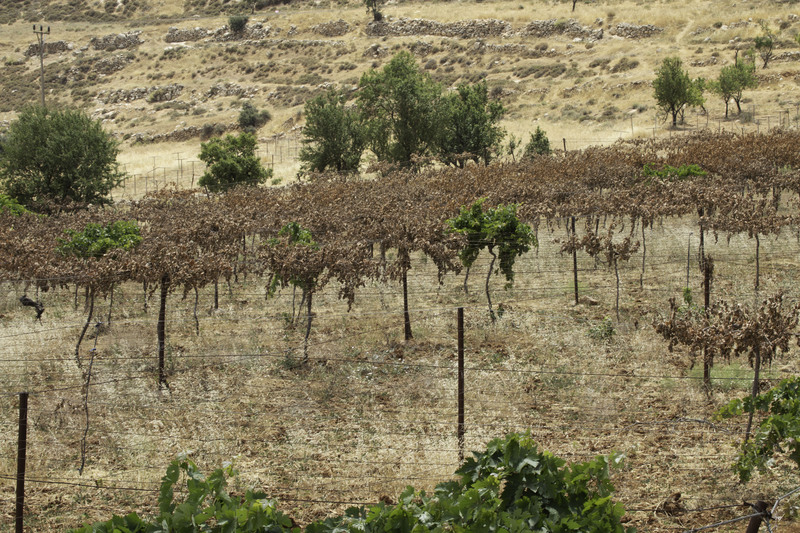 Highway 356, between Hebron and Bani Na’im. 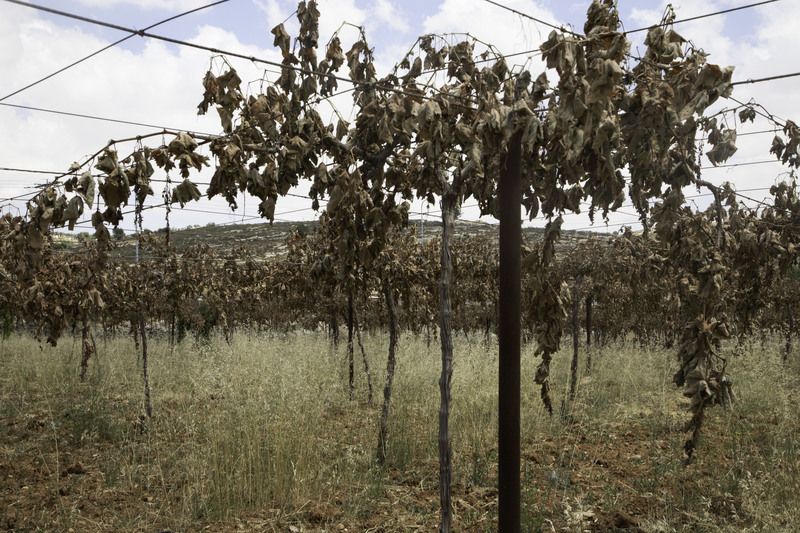 On the way back to Jerusalem we pass a ruined vineyard, like one we passed on highway 60 last week. This time, its owners are standing by the side of the road. 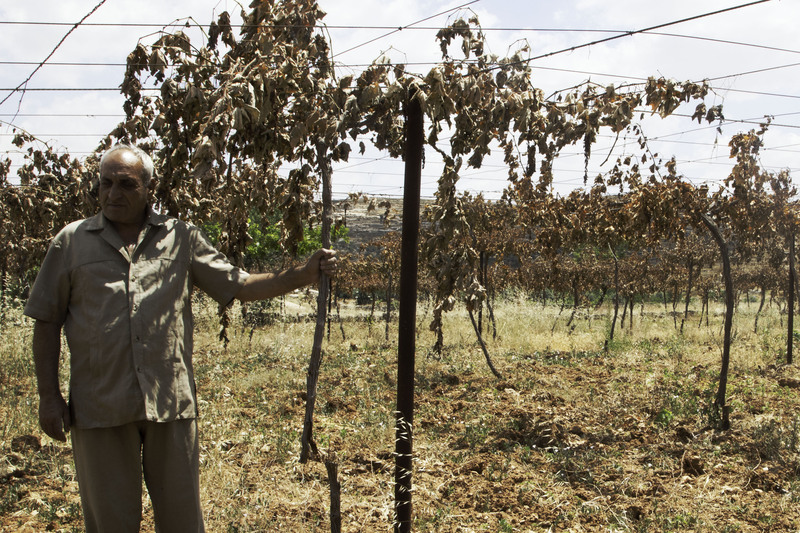 We stop and let Mohammed and Abu Abdella show us how the dead vines, cut near the base by settlers, still hang from the top of the structure built to support them. They invite us in, but there is no way to serve us anything. After all, it is Ramadan. Suddenly my throat feels parched, even though I have been drinking water all day. Thanks,Soryl. I know you’ve had experience with on that road!